One can only imagine how the pre-Columbian Salado people, who occupied Tonto's cliff dwellings from about A.D. 1300 to 1450, perceived their natural environment. In order to survive in the arid landscape, they undoubtedly took advantage of every possible resource, plants and animals. But I couldn't help but wonder if those early inhabitants also had enjoyed the scenic splendor of their canyon, wondered at the soaring vultures and hawks, or been in awe of the myriad of birdsongs rising from the slope below. I gazed down that same slope one early spring morning, tracing the Vi-mile (.8 km) trail that zigzagged up the steep 350-foot (107 m) ascent from the visitor center, and identified the numerous birds around me. The most obvious were the large turkey vultures that soared along the slope and over the cliffs. Their all-dark plumage, bare red heads, long wings held in a shallow V-shape, and the slight rocking of their bodies were clearly evident. The other large black birds, although somewhat smaller than the vultures, were the common ravens, with their coal black plumage, wedge-shaped tails, and large heads and bills. One pair of these noisy creatures had constructed a stick nest in a crevice above the cliff dwelling. From the constant attention given the site, I could only assume that it contained nestlings. It wouldn't be long before these gregarious birds would be showing off their youngsters. The parents' teaching them about finding food, harassing their neighbors, and the secrets of aerial acrobatics would provide considerable amusement to the human visitors along the trail. Two smaller groups of birds were diving and soaring along the cliffs, sometimes in wild plunges from high overhead, past hikers, and into the valley below. The fastest of the two were white-throated swifts, identified by their swept-back wings and black-and-white bodies. These speedsters have been clocked at more than 100 miles (160 km) an hour in a dive; I could feel air movement when they passed nearby. The other small birds of the cliffs were cliff swallows, easily separated from the swifts by their flat glides and normal wingbeats, white bellies, dark wings, blackish throats, buff to cinnamon collars and rumps, and square tails. Both of these birds nest along Tonto's cliffs, but they utilize very different methods. Cliff swallows build mud nests with tubular entrances, constructed of hundreds of tiny mud pellets glued together with the bird's saliva, and placed high on the cliffs. These colonial nesters can number in the hundreds, and their feeding activities help control flies and other flying insects, which they consume by the millions. Swifts, on the other hand, build their nests of feathers, also glued together with their saliva but placed inside crevices on the high cliffs. While each swallow compartment is limited to one pair and their nestlings, a dozen or more swifts may utilize a single crevice. Tonto's swallows and swifts are summer residents only. The swift is one of the earliest birds to return in the spring, a sure sign of the new season. They winter to the south, from the southern border of the United States (see chapter 21 on Chiricahua and chapter 31 on Big Bend) to Central America, utilizing crevices in cliffs like those at Tonto. Cliff swallows travel all the way to South America for the winter. They are true Neotropical migrants, and one of Tonto's best connections to the tropics. The health of their South American habitats is just as important to the cliff swallows' long-term survival as are those environments in which they spend their summers. Tonto National Monument encompasses 1,120 acres (453 ha) of rugged canyonlands just above Roosevelt Lake in the Sierra Ancha Mountains of south-central Arizona. The monument was established in 1907 to protect the remains of Salado cliff dwellings, built in natural caves. The Lower Ruin consists of 16 ground floor rooms, 3 of which had a second story, and a 12-room annex; the Upper Ruin contains 32 ground floor rooms; 8 had a second story. The cave dwellings are situated on southeastern-facing slopes approximately 700 and 1,100 feet (213-335 m) above Salt River (or Roosevelt Lake). Park elevations range from 2,300 feet in the north to 3,900 feet (701-1,189 m) in the southwest corner. The area lies within the upper edge of the Sonoran Desert, where tall, stately saguaro cacti dominate the slopes and ridges. Other common plants include catclaw acacia, honey mesquite, palo verde, jojoba, and ocotillo. Less numerous are the century plant, four-winged saltbush, sotol, tomatillo, broom snakeweed, and a variety of cacti. Tonto Creek supports a riparian zone where Arizona sycamore, Arizona walnut, net-leaf hackberry, and mesquite are most numerous. The park visitor center lies at the end of a 1-mile (1.6 km) entrance road off Highway 88. There can be found an information desk, exhibits, a 12-minute slide program, and a sales outlet; bird field guides are available, and a checklist is available for the asking. Interpretive activities include the self-guided Lower Ruin Trail, and guided tours to the Upper Ruin in fall, winter, and spring, on a reservation-only basis. There is a small picnic area along the entrance road, but there is no camping inside the park. Additional information can be obtained from the Superintendent, Tonto National Monument, HC 02, Box 4602, Roosevelt, AZ 85545; (602) 467-2241. Songbirds were active along the slope, chasing one another about the abundant shrubs or singing from the top of saguaros or other high posts. The rolling songs of cactus wrens were most obvious, like a deep, throaty "chuh, chuh, chuh, chuh," with a number of variations. Their football-sized, grass nests were abundantly evident along the slope, built on chollas and spiny shrubs. These birds keep even their old nests in repair, raising new families in the newer one and using the older nests for roosting sites. One especially vocal cactus wren was perched at the very top of a tall saguaro to the right of the cave dwelling. I could clearly see its rust-brown cap, bold white eyebrow, streaked back, and whitish underparts with black spots. See chapter 29 on White Sands for additional details about this large wren. The smaller, red-breasted bird, perched on another saguaro, just down the slope, was a male house finch. Its song was far more melodious than the cactus wren, and it seemed to continue indefinitely. It was a long series of scrambled phrases, like "swing, swing, swing, sweem, sweem, te swee," sung over and over again. Its mate, all brownish with a heavily streaked breast and belly, was perched on a nearby catclaw, also singing the same song. I couldn't help wonder if they were purposely dueting, like so many tropical wrens. They suddenly took flight, passing overhead toward the top of the cliff; they were calling sweet "cheet" notes as they passed. A Gila woodpecker suddenly appeared out of a hole in a saguaro further down the slope, flying up to one of the massive arms, and called out a loud "churr" note. I focused my binoculars on this medium-sized bird and could see it was a female, without the male's bright red cap, but with fawn-colored underparts and a black back, heavily barred with white lines. In flight, its bright-white wing patches were most evident. The smaller ladder-backed woodpecker, another resident of the park and greater Southwest, also possesses a black-and-white back, as well as a black-and-white head. But the Gila woodpecker is restricted to the saguaro cactus forest of Arizona and adjacent Mexico. It and the saguaros reach the northeastern edge of their ranges near Tonto. This woodpecker bores nest holes in saguaros that provide nest sites for a large number of other cavity-nesters. See chapter 20 on Saguaro for further details about this unique species. One of these cavity-nesters is the tiny elf owl, the world's smallest owl at less than 2 ounces (57 g). It is fairly common at Tonto, in spite of being rarely seen because of its nocturnal habits. Elf owls have a loud voice, "which consists of chucklings and yips like a puppy dog," according to Allan Phillips and colleagues, who wrote in The Birds of Arizona that "most of their calling is done at dusk from the entrance to the hole, and again at dawn, following the Cassin's kingbird chorus. Also they call incessantly during moonlit nights in spring, after which they are hard to detect." 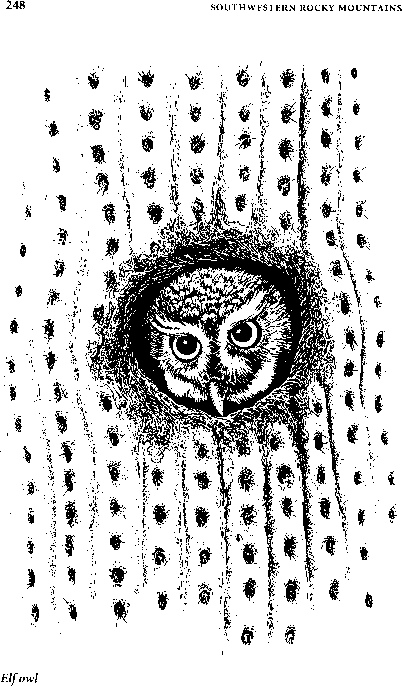 Most elf owl sightings are limited to flashlight observations of their heads at the entrance of a nest-hole high in a saguaro. Their dark bills, whitish eyebrows, and bright yellow eyes give them a truly ferocious appearance. Indeed, they are a deadly predator that takes a wide variety of creatures, including insects caught on the wing or on the ground, such as moths, grasshoppers, and crickets, as well as scorpions, lizards, and snakes. Several loud "ka-brick" calls of ash-throated flycatchers resounded around me, but it took several minutes to locate one of these rather plain, slender birds, perched on a palo verde down the slope. Through binoculars, its grayish throat and breast, yellowish belly, and brownish cap and rufous tail were obvious. It suddenly shot almost straight up for 20 feet (6 m) or so, grabbed a passing insect with a snap of its bill, and returned to the same perch with a quick flip of its tail. Insects and spiders make up about 92 percent of its diet, with fleshy fruits accounting for the remainder, according to Arthur C. Bent. Other birds were present that morning. I spotted a red-tailed hawk, with its brick-red tail; white-winged doves were calling "who cooks for who, who cooks for you-all;" mourning doves were singing low, mournful songs; the equally sorrowful song of a Say's phoebe came from below the visitor center area, where I later found it nesting under the roof edge; rock wrens, all-grayish birds with their jerky motions, were calling loud trills; a curve-billed thrasher produced its loud snapping calls from the little wash to the right; the mellow whistles of a Scott's oriole floated across the canyon; and a pair of canyon towhees greeted one another with loud screeching calls. I located the canyon towhees on a rock outcropping 100 feet (30 m) below me. I watched them through binoculars as they went about their strange behavior, which I attributed to courtship: one individual, I assumed the male, was standing before the other with its wings drooped and quivering all over, like a leaf in a breeze. Both birds called loud and continuous "pink" notes. Their rufous caps glowed in the morning light, contrasting with the rest of their rather drab, all-brown bodies, except for their cinnamon-colored crissums. This bird nests on the ground or on low shrubs amid grasses, where they utilize "mouse-runs" through the grass for escape routes. The male suddenly put its head back and sang a song that sounded like "chili-chili-chili-chili." The canyon towhee was once lumped with the California towhee under the generic name of "brown towhee" until it was split into two species by the American Orithologists' Union. Its range extends from eastern Arizona to the Texas Big Bend Country, north only to southeastern Colorado. Two additional birds were encountered on my walk back to the visitor center that morning, Gambel's quail and black-throated sparrow. I had detected distant calls of GambePs quail from the ruins, but their four-note "chi-CA-go-go" calls, the sounds of Western movies, were most common near the canyon bottom. Then I discovered a lone male perched on a catclaw at the far corner of the visitor center parking lot. It was standing erect with its allblack plume and face, rufous cap, grayish chest and nape, and rusty wing patch highlighted by the bright sunlight. We watched each other for several minutes before it flew to the ground, where I could hear low clucking calls, probably from its mate. Black-throated sparrows were common in the lower canyon, and even more numerous near the picnic area later in the day. This lovely little sparrow is one of the park's common full-time residents, distinguised by its coal black throat and face, bold white eyebrows and a slash between the throat and cheeks, grayish underpays, and gray-brown wings and tail. During the spring months, when birds are most active, its tinkling bell-like songs are abundant throughout the desert. It also seems to be one of the area's most curious birds, responding almost immediately to low spishing notes. Greater roadrunners also occur in the park but are more common below the canyon in the open desert, according to Dessamae Lorrain, one of the park's interpreters. She told me that this long-legged bird, made famous by its cartoon character, is one of the park's most asked-about birds. northern mockingbirds, with their aptitude for mimicking other bird-songs; and blunt-headed, black-and-white loggerhead shrikes. Tonto Creek s riparian habitat supports a very different assortment of birds, although there is some overlap with the adjacent desert environment. Many of the desert birds visit the creekbed for water, and many of the riparian species sing from high points or search for food in the adjacent desert. Common riparian species include the little black-chinned hummingbirds; western wood-pewees, which sing descending "pe-eer" songs; tiny Bell's vireos, with their distinct question and answer songs, described by Phillips and colleagues as, "Wee cha chu we chachui chee? Wee cha chu we chachui chew! "; equally tiny Lucys warblers, with their all-grayish bodies, except for rufous rumps and nondescript crown patches; rosy-red summer tanager males, with their yellowish bills; all-red, crested northern cardinals; and the dark-backed lesser goldfinches, with their canary yellow underparts. Other birds found in the Cave Creek riparian zone and adjacent thickets include western screech-owls with their "bouncing ball" songs; black-tailed gnatcatchers with their distinct scratching calls; the black-and-white, crested bridled titmice; western kingbirds, with their yellow bellies and black tails with white edges on their outer feathers; white-bellied black phoebes, which frequent the creekbed; Bewick's wrens, with their long tails and white eyebrows; crissal thrashers, a long-tailed bird named for its rufous crissum; the pert phainopepla; the large-billed, black-headed grosbeak; and hooded and northern orioles, both with orange-yellow and black markings. Phainopeplas are fascinating birds for several reasons. They are North America s only representive of the silky-flycatcher family. They have two breeding seasons; April and May breeders apparently move northward and nest again in June and July. And they are one of the handsomest of birds. Both sexes possess a tall, somewhat shaggy crest and slightly fanned tails. The males are coal black, except for blood red eyes and snow white wing patches visible in flight. Females are duller versions of the charismatic males. The scattering of junipers and pinyons that occurs along the cooler north-facing slopes supports a few additional birds, including Cassin's kingbirds, scrub jays, mountain chickadees, plain titmice, western bluebirds, black-throated gray warblers, and western tanagers. In winter, surprisingly large populations of birds occur within Tonto's riparian habitats. Most numerous are blue-gray gnatcatch-ers; tiny ruby-crowned kinglets, with their constant movement, white eye rings, and bright red (partially hidden) crown patches; nondescript, long-tailed house wrens; secretive hermit thrushes; tiny, reddish-capped chipping sparrows; larger lark sparrows, with their boldly marked chestnut- and white-striped heads; Lincoln's sparrows of the thickets, which possess buff chest bands; white-crowned sparrows, with the adults' distinctly marked black-and-white head stripes; and bright yellow-and-black American goldfinches. Other less common wintering birds include sharp-shinned hawks, northern harriers, American kestrels, red-naped sapsuckers, mountain bluebirds, yellow-rumped warblers, song sparrows, dark-eyed juncos, and Lawrence's goldfinches. In summary, the monument's bird checklist includes 143 species, of which 89 are listed as permanent or summer residents, and assumed to nest. 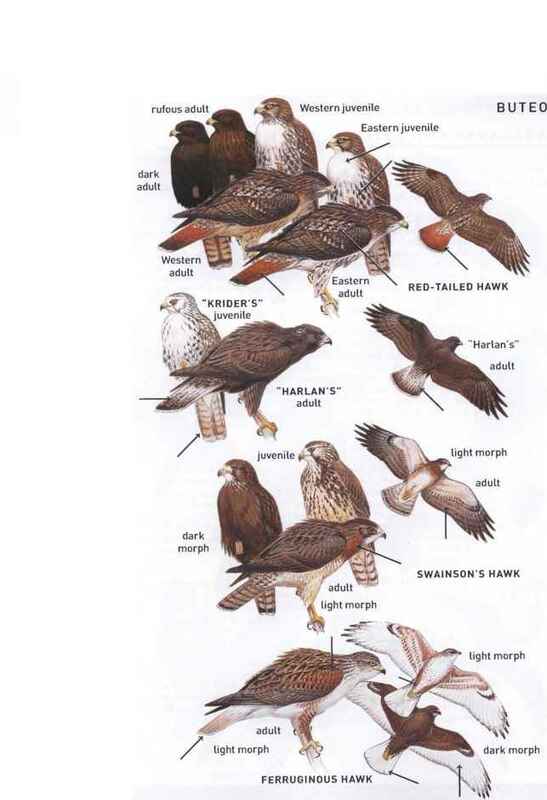 Of those 89 species, none are water birds, 10 are hawks and owls, and 6 are warblers. Turkey vulture. This is the large soaring bird, with bare all-red head, that holds its wings in a shallow V-shaped position and rocks slightly from side to side. Greater roadrunner. Watch for this long-legged cuckoo in the desert areas below the canyon. Elf owl. This tiny, yellow-eyed owl nests in unused woodpecker holes in saguaros; it is active only after dark. White-throated swift. From early spring through fall, these speedy black-and-white birds are common along the high cliffs. Gila woodpecker. This is the large woodpecker of the saguaros with a black-and-white barred back and loud "chuuur" calls. Ash-throated flycatcher. Often detected first by its loud "ka-brick" calls, it is a slender bird with a grayish throat, yellowish belly, and reddish tail. Common raven. It can be common over the cliffs or visiting the picnic area and parking lots; it is all-black with a wedge-shaped tail and large head and bill. Cactus wren. This is the large wren that builds grass nests on the chollas and sings loud, hoarse "chuh chuh chuh chuh" songs. Black-throated sparrow. It is a true desert bird of the open slopes that sports a coal black throat, two white face stripes, and a whitish belly. House finch. Males possess bright red throats and foreheads and heavily streaked bellies; it is one of the park s most common and gregarious species.